Last month, I celebrated my birthday by spending several days in Cuba. Though I initially had some hesitation about the trip, I ended up having a great time and learned so much about Cuban culture and the Cuban perspective. I also learned a lot about the actual act of traveling to Cuba, which isn't like traveling to other places, particularly as an American. Traveling as a tourist is still not allowed for U.S. citizens, so you have to travel under one of the 12 listed categories specified by the U.S. Department of Treasury (see those categories here). Being a travel blogger and occasional freelance writer, I chose Journalistic Activity as the reason for my trip because I knew I would write about Cuba and, well, it was accurate. Americans need a visa before going to Cuba. Fortunately, it's possible to purchase one at the airport, depending on the airline you're flying – CHECK WITH YOUR AIRLINE! I flew JetBlue, so when I arrived at the airport to check in, I bought my visa for $50 with my credit card and continued on to security. It was simple and very easy. Travelers visiting Cuba — both foreigners and Cubans living abroad — are required to have travel health insurance. U.S. health insurance cannot be used in Cuba due to the embargo. But again, fortunately, this is something you can get depending on the airline. The cost of travel health insurance was included in my JetBlue airfare, so it wasn't something I had to worry about. Confirm with your airline whether travel health insurance is included! The money situation for Cuba is a unique one. The gist: bring cash money to Cuba! Word on the street is that U.S.-backed credit and debit cards cannot be used in Cuba. In full disclosure, I didn't try to use my debit card in Cuba, but I do know Cuba is on the list of my bank's sanctioned countries. I also did not see any tourists using ATMs, so you need to bring all the money you intend to spend in the form of cash. I read somewhere to budget $100 USD/day (which converts 1:1 to Cuban CUC) for mid-range spending, and I would agree. I did not do that and quickly realized on day one that I had not brought enough money, so I had to be very mindful of my budget every day. Cuba is a place of mostly extremes when it comes to accommodations. You have your high-end hotels like Hotel Saratoga where Bey and Jay stayed, and then you have your casas particulares, which are private homestays that tend to be in the $30-100/night range (most closer to $30/night). The mid-range options are not nearly as plentiful. I stayed in a casa particular in Old Havana that was essentially a bed and breakfast with six rooms to rent (Hostal Calle Habana – check them out here). I enjoyed where I stayed, but it ultimately comes down to your budget and comfort level. 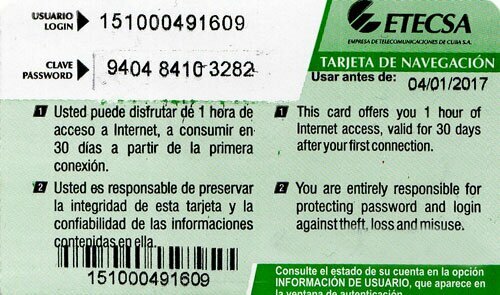 You can get wifi in Cuba, but first you need an ETECSA card, which sells for 1.50 CUC for one hour of wifi access. You then need to be in an area where wifi is available. Many of the hotel lobbies have wifi, albeit it's inconsistent at times, but I actually think it's a great opportunity to disconnect for a bit. I spent the majority of my time in Cuba disconnected, and it was great. No whipping out my phone out of habit (okay, maybe a few times) and more time spent enjoying my surroundings, sans the internet. Because wifi is inconsistent, you can't exactly depend on being able to search and pull up whatever you need on your smartphone. But if you're like me, you know you'll need to figure out 1. how to say something in Spanish and 2. where you're going. Luckily there's Google Translate, which you can use offline to help you translate phrases into Spanish, and maps.me, an app that shows offline maps and directions. Both were extremely helpful for me while I was in Cuba! Unfortunately, I'm one of those travelers with a weak stomach who's gotten sick more than her fair share (and yet insist on still trying street food). There was that one time in India, then that time in Costa Rica. Oh yeah, and those four or five times in Ghana. Needless to say, whenever I read that I should not drink the water, I try with all my might to not drink the water. Cuba was one of those places. I brushed my teeth with bottled water, only drank bottled water at all times and watched the ice — and I didn't get sick even once! Success! Listen, I like dressing up as much as the next person, and I would be lying if I said I hadn't brought cute dresses and my red jumpsuit to Cuba, but I also realized once there that this is more of a cute sandals, flats and sneakers place, not the place to rock your stilettos. I mean, you still can, but make sure you have a taxi or trike to take you where you have to go because the roads and sidewalks are not meant for runway strolling with your heels on. This may be obvious to many people, but I will admit I wasn't sure what to expect when it comes to tourism in Cuba. I clearly knew that Canadians, Europeans, Australians, etc. had been going to Cuba for decades, but it wasn't until I went to Havana and Viñales that I realized just how many tourists are in Cuba. There are a lot of tourists. Not necessarily more than other Caribbean islands but certainly more than I anticipated. So don't think you'll arrive there and be one of 20 tourists. More like one of 20 buses of tourists. The Food is Great, So Make Reservations! I don't understand where this rumor got started, but before I went to Cuba I read/heard that the food was bland and not that great, so don't expect much from meals. This is incorrect. I had some fantastic food in Cuba! My favorite meal was at San Cristobal Paladar (where the Obamas ate when they were in Havana). I found the food to be well flavored, and overall I think Cuba is a great place for seafood lovers. But make reservations! We tried going to a few of the more popular places on a Sunday night and could not get into four different restaurants without reservations! Craziness! One of the things I've been mentioning to friends and family who ask about my trip is just how truly amazing and cool the classic American cars are. Though the vintage cars are plentiful due to the embargo, my sense is that they've become a source of pride and differentiation for Cuba. The colors run the gamut and the ways in which these cars are maintained are truly impressive. It is genuinely one of the things I loved most about my time in Cuba. There are so many other things I can say about Cuba, but all I'll say for now is to go. Once you go, you'll have a deeper sense of the history, the people, the Cuba of today and how this country is evolving. So, read the above 11 things and then make your way to Cuba.